Pet Botanics E-Collars Assorted Colors - Large (Neck Size: 9 1/2"-15 1/2") Relieve your pet's endless cycle of biting, licking and scratching. Safe, lightweight and comfortable E-Collar with padded neckline stops your pet's self-inflicted wound aggravation and allows topical medications to be effective. Transparent collar allows your pet to maintain his peripheral vision. Size - Large (Neck Size: 9 1/2"-15 1/2") Directions Directions: Each E-Collar has unique snaps on one side of the collar. Simply place the collar snugly, but not tight enough to choke, around the pet's neck. Line up the snaps to the properly positioned holes on the opposite side of the collar and press together. To snap the E-Collar into the selected holes: Start at one end of the snap. Position two fingers under the snap and hole. Firmly support the collar from below. Push down one end of the snap. Repeat procedure on the end of the snap. 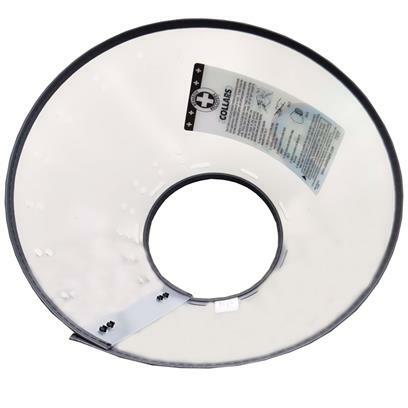 If the E-Collar is still too loose, simply attach the E-Collar to your pet's collar with gauze or string.